Still looks like good weather for the holiday weekend. Temperatures in the mid to upper 70s with a slight chance of rainSaturday and Sunday. So far, non-stop generation. Yesterday, it was a little more stable and today, they are holding it pretty much as projected, 70 mwh with approximately 5500 cfs. Tomorrow is still a mystery. Stan on the water yesterday morning with Fred from Springfield, and his son, Troy who is home on leave. The fished with Stan last August and it was one of those day when the water had been off for quite a while and when they fired up the first generator, it turned to mud. Second generator came on and more of the same, only faster. Had quite a bit of water runing again this year, but fishing was definitely better. Almost everything caught on the big ruby with the #18 ruby dropper. Darrell had two of his relatives from Norway, Kristan and Sting out in the afternoon. 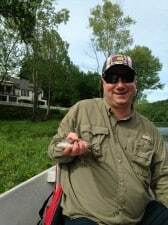 Fishing a bit slower in the afternoon, but Sting caught his first trout on a fly rod on the #16 red d-ribbed midge. This was probably their best fly for the afternoon. 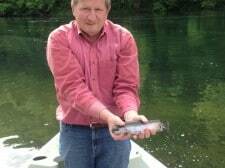 This entry was posted on Friday, May 24th, 2013 at 11:49 am	and is filed under Fishing Reports. You can follow any responses to this entry through the RSS 2.0 feed. You can leave a response, or trackback from your own site.